If you’ve ever worked in a large organisation, you’ve come across the bureaucracy it created. Static performance management systems seemed to be forced on both manager and employee. Many questioned their effectiveness and it’s not surprising that corporations are now moving towards more frequent feedback. For SMEs, giving feedback is a nothing new. All employees need to contribute to the success of the company. SMEs simply can’t afford to carry dead wood. Yet, we don’t like to give negative news, some even dread giving feedback. Especially in this region, sharing constructive feedback is often avoided, no matter how beneficial it is for the employee and the SME. Here are our tips for you to overcome your fear of giving constructive feedback and helping the employee to perform as expected. There’s no point in waiting days or even weeks to give feedback. If you delay the conversation, an employee may not even remember the situation at hand. Choose a quiet place where you can talk without interruptions with the employee. Feedback should not be used to criticise the employee in front of others. It is meant to improve a situation by enhancing the employee’s skills, knowledge or behaviour. When did the situation occur? What is the impact on those involved? Is impact reaching beyond those involved, e.g. on the client, the team or the business? What was the effect of the employee’s actions and/or behaviour? Keep it to one, maximum 2 related topics or otherwise the message gets lost. It’s easy to drift and blame the employee’s personality. Feedback, however, is not meant to put down the employee. Stick to the facts without attacking the employee and give recommendations how the employee’s behaviour can be improved. As you feed back on the improper or poor performance, reaffirm or establish your expectations for the future. Be sure your expectations remain realistic and performance goals are achievable. You can link this back to the current situation and how the employee fell short. The employee can understand what would have been required of them and what will be required of them to succeed in the future. Many managers like to give a feedback sandwich. They start off with a positive comment, share their feedback on what needs to be improved and end with something positive again. It’s often thought that we don’t want to make the employee feel bad. Unfortunately, most employees will only hear “Everything is good” and won’t take on board the recommendations leading to improved performance. As soon as possible after the feedback session, summarise the suggested actions for improvement and share the action plan with the employee. Keep a copy of the letter or email and it’s recommended to retain it also in the employee’s personnel file. Should further performance actions be required, you want to have a record of previous discussions. Most managers forget to follow up with the employee. Without checking how the employee’s performance and/or behaviour has improved, feedback doesn’t reach its full potential and becomes meaningless. Giving feedback doesn’t need to be a daunting task. Done properly, it can be an effective communication tool, support a performance driven culture and increase the productivity of your team. These 7 steps will guide you and give you more confidence when helping an employee to develop and perform at a higher level. Agni Skafidas has spent over 17 years in general and specialised HR roles in the Middle East, Europe, the UK, the US and Asia. Her wealth of knowledge in HR, project management and coaching have driven her success and commercial understanding. OLAM is a consultancy firm simplifying HR to fit their client’s needs and culture. 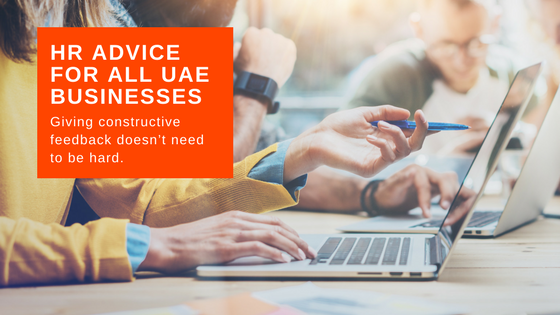 They know how to translate best practices and global standards into pragmatic solutions for their clients, allowing them to focus on their core business activities. Being recognised for her achievements, Agni had the opportunity to lead HR teams in operational and strategic roles and served as Director, Total Rewards for APAC and Emerging Markets based in Dubai before founding OLAM. Schedule an obligation free consultation with one of our Business Setup Advisors today.